An A to Z of Do More With LES Thru The Years & What Will Be Missed! A – All of it! I’ll miss all of my amazing clients turned friends that I’ve met along the way! G – Getting to work from home, in my jammies, rain or shine, even during snow storms! Doesn’t get any better! I – IAD – Dulles Airport – The curbs at arrivals and departures, as well as the cell phone waiting area will miss me terribly! Not sure it’s mutual! IAD became home-away-from-home! N – National Airport – now there’s a cell phone area I won’t miss too terribly even tho the drop offs were so easy! 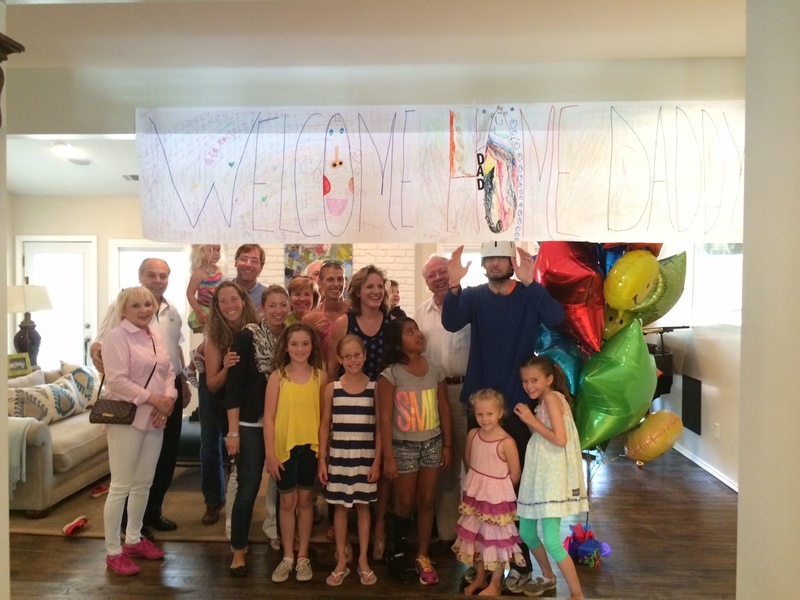 O – Open Houses for the Goodhart Group. Fun Sunday afternoons spent in a home for sale trying to sell, sell, sell the location, location, location! Q – Quickbooks! I will miss reconciling bank accounts for clients! R – Referrals! My real estate license remains on referral status! Let me know at anytime if you’re looking to buy or sell. I know great realtors! Do More With LES wouldn’t exist today if it weren’t for your multiple referrals, so Thank YOU! U – UPS & FedEx will suffer greatly without Do More With LES! Z – Zip. Zero. There’s NOT ONE way to thank you all! For your referrals, for your money, and most of all for your trust! I thank you! Remember, in a few short weeks just Do More is going away, not LES! Mack & I watching the Nats game! Do More on Moving Day! Dogs I woke up with one Christmas morning! Mrs. Claus, LES & Santa! Loaded everything & the car, too! D & R never left me. Do More Proud Sponsor of Kelley Cares 5K! There’s no easy way to put this, but the truth is: bad things happen to good people! My friend, Z. Taylor Shultz is a son, father, colleague, and loving husband. He’s completely Texan and to use the words of his wife, “just the nicest guy you could ever, ever meet.” Period. So – why? Why did this terrible “accident” happen to Taylor? To those around him who work with him, who went to school with him, and who love him? Why? There is so much expense involved when something like this happens to a family. Melissa, Taylor’s rock and one true love, might need a break while getting settled in her new little home sweet home in Dallas. If Melissa even begins to dream about leaving home, she must find someone to “just be” with Taylor. In order to hire in help, there is a $20 gap in coverage financially for Taylor’s care. Twenty Bucks for Taylor is the answer and YOU can help be a part of the solution! Having a lot of friends (like any friends of Melissa & Taylor certainly do) has to pay off somehow. There has to be something more we can do. Together! Twenty bucks, that’s all we’re asking! Click below and give just $20 today. Twenty bucks for Taylor! Then share and spread the word and good vibes far and wide! I had a colonoscopy today. Literally in desperate need of getting to the root of the problem, I moved it UP from 6/20 to 6/13 without a care in the world that this meant I’d have my first, at 37, on Friday the 13th! The prep was as gross as they all said it would be, even tho Dad made some pretty fantastic multi-colored (ok, yellow & green!) 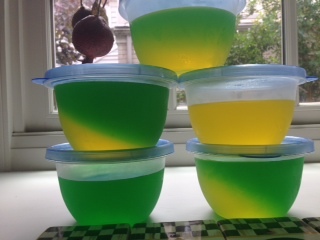 jello servings, but in the end not too bad, but not something I’d like to do again in a month or in five years. All test results will be available next Friday. The best news: Taylor came home today! For those of you who do not know or have not heard, fab clients turned dear friends, complete with cute kids, moved to Texas and all Texas-sized hell broke loose. Literally. Taylor (the dad & husband, read man of Melissa’s dreams!) was in a horrible car accident while working on Friday the 13th (of September, 2013) and that cute Shultz family hasn’t been the same since. Fast-forward nine months and BAM! Taylor came home today by way of nothing short of a miracle! You can follow Taylor’s story of success here on Caring Bridge. Anything you can do to help “Twenty Bucks for Taylor” would be hugely appreciated! One of my cutest little clients, Chloe, uses Do More with LES as a chauffeur service from after school care to home for snack and homework fun! 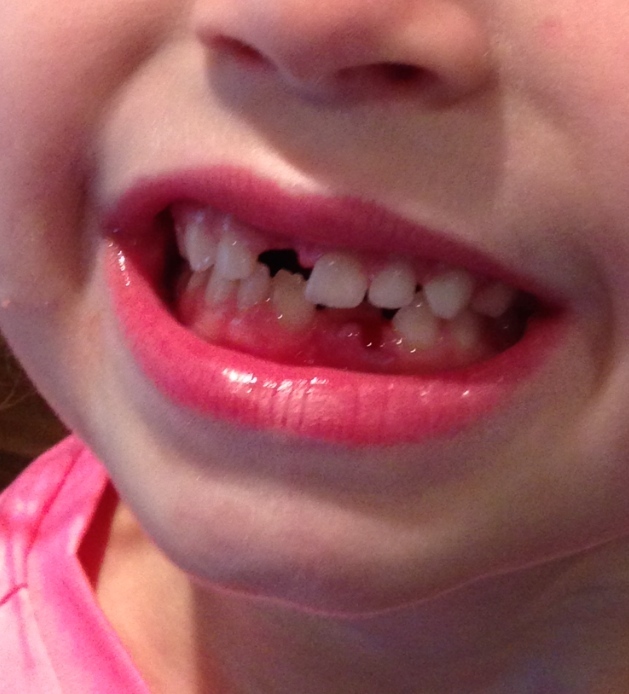 She just might have mentioned that she had a loose tooth and wanted an apple for snack last week. I asked her to show me this tooth and she proudly showed off how it was hanging by a thread, its replacement already fully grown up and in. I sliced the apple in half and we each had a wedge in hand as I showed her how best to take big bites out of the loose tooth side of the mouth and we’d get it easily! No luck! “Let’s go upstairs and look at it in the mirror,” she exclaimed. “OK,” I thought, “great, I’ll grab a dry paper towel and your water bottle!” And off we went. I had that poor cute Chloe admiring herself one minute and in a headlock the next! She was just the right height for me to get a hold on her….and her tooth! The rest, as they say, is history! 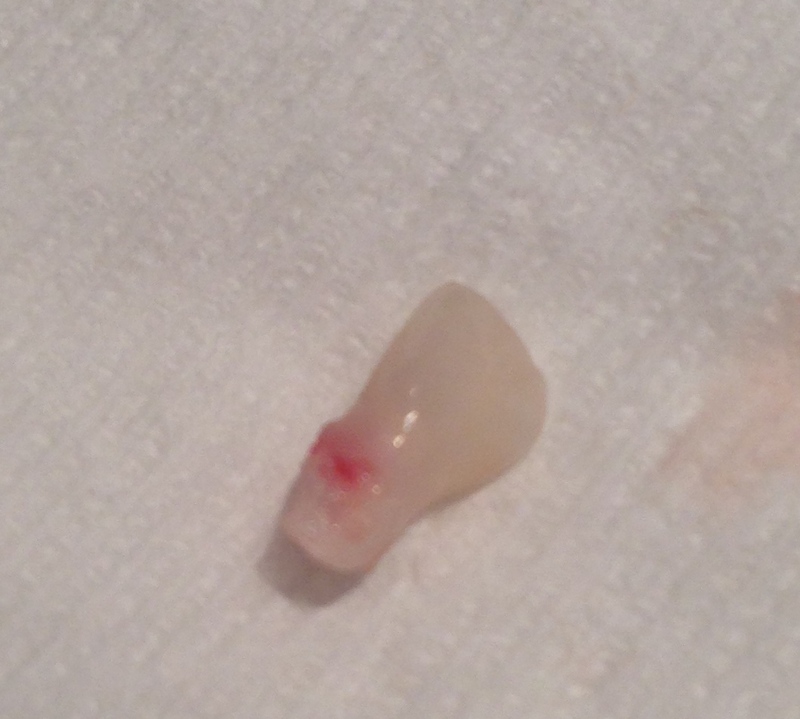 A picture of the bloody smile and the cute little tooth (with a lot of root!) shows it all. 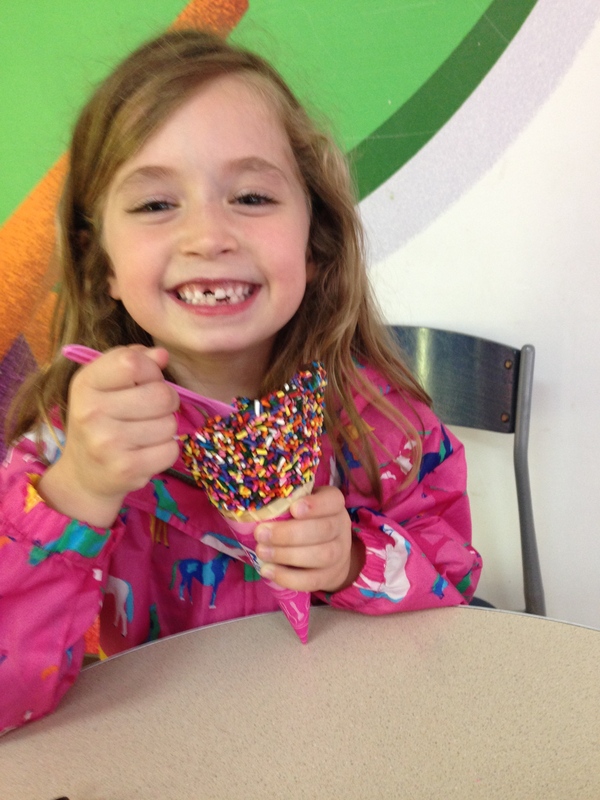 The next day was our last together, so I took Toothless Chloe out for Baskin-Robbins after school. “Shhh, don’t tell my parents, but can you get me the big waffle cone? The one with the chocolate and the sprinkles already on it?” Sure! This is the deal: dog sitting just isn’t what it used to be anymore. You see, I’ve semi-retired from pet-sitting services, but for this one client in particular, I still will. WHAT?! So, the NatGeo guys and I, Jon & John, became fast friends as there is the perfect viewing spot of this tree from Zach’s owner’s office window. The boys next door have since named this raccoon, and as such, “Rhonda the Raccoon” has become a topic of everyday conversation. 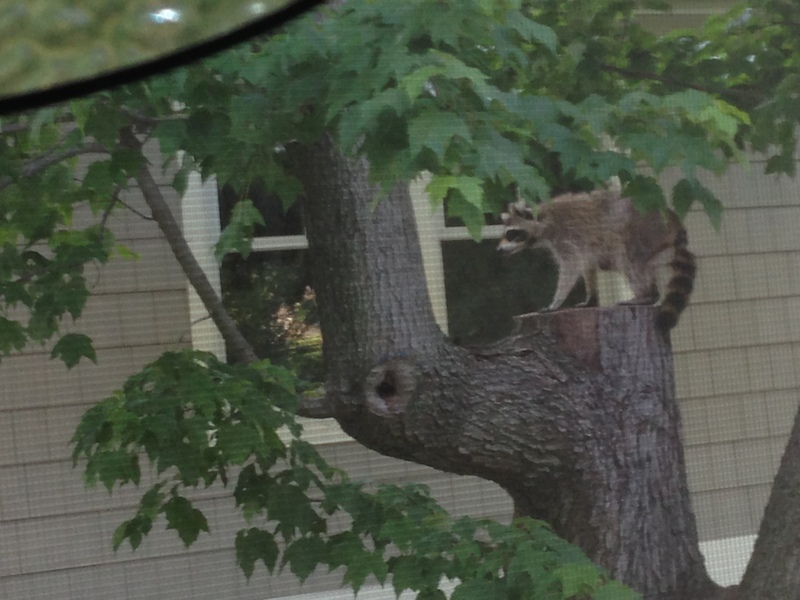 I came upstairs one morning after a walk with Zach and Rhonda is just perched atop her tree hole plain as day. I walked outside (well after dark) and one John is on the neighbor’s porch and the other John is on Zach’s porch and BAM! 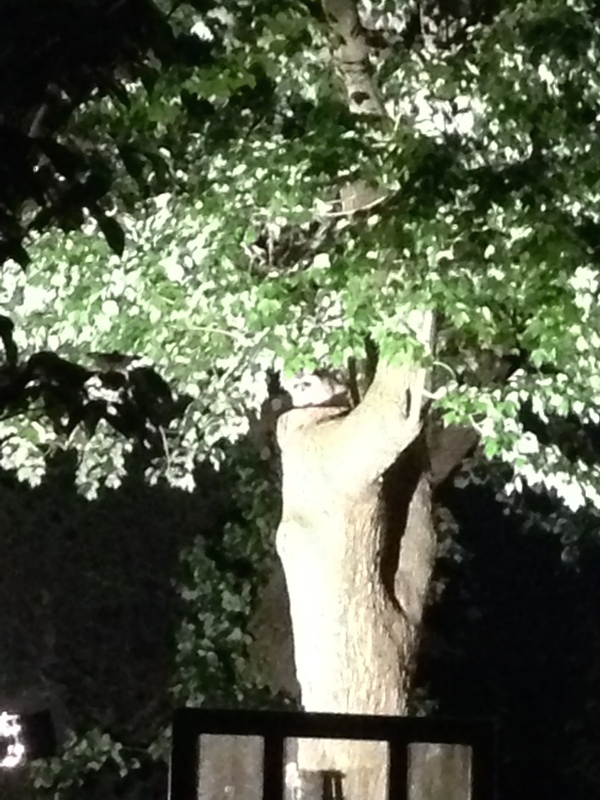 …there’s Rhonda in all her spotlight lit up glory! Yes, nature is beautiful, no, rodents I am not a huge fan of, but this was pretty cool! Every day is an adventure with LES, that’s for sure! Stay tuned. Why do bad things happen to good people? In Alexandria? In Bath County? In Aurora? At Sandy Hook? At Columbine? Anywhere? Why? This City has lost way too many of “the good ones” for all the wrong reasons and much too soon. Some lose battles to cancer, some in car accidents, some for reasons we will never know, but all for reasons we do not understand. The names I’ve mentioned above belong to people we know and love throughout our “fair” City. However, the reasons behind their deaths quite literally are just not fair. Period. Over two dozen people gone too soon. Young. Old. Black. White. What is the world coming to? Think about it? That whole adage: everything happens for a reason. Really? Why do bad things happen to good people? Good question! Still very much trying to “wrap my brain around” the events of Thursday in our quiet neighborhood, I struggle to truly comprehend just how many lives were changed with the simple “ding dong” of a residential doorbell being answered. Simply awful. Ruthanne is the mom of 3 daughters, all not far from my age, but was also the music teacher to probably 3,000+ children in Northern Virginia. While I understand this is in no way about me, there are ties that bind. I had “Mrs. Lodato” for music class when I attended Blessed Sacrament School for 7th and 8th grade. I had her sister “Mrs. G” (-iammittorio, which I know how to spell by singing a song!) for Science class. 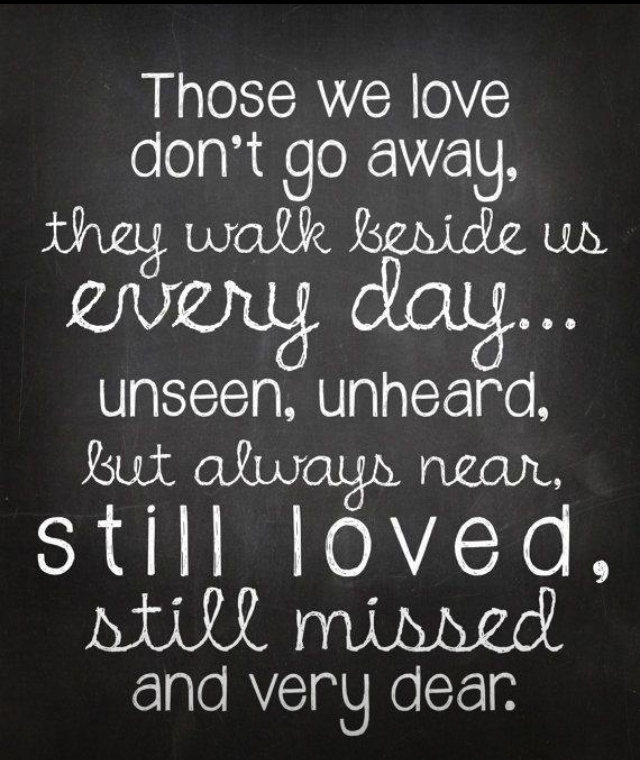 Lucky for me, I had her nephew, Danny, in my classes and still call him a friend and we keep in touch to this day. I babysat for most of my adult life (starting as a teenager) and in that capacity I continued to see “Ruthanne” (no longer “allowed” to call her Mrs. Lodato, guess I was too “old!”) when I would take “my kids” to Music Together at Del Ray United Methodist Church or to her home for private piano lessons. Whenever she saw me she oozed love of life and zeal for music. Conversations flowed naturally as we would always pick up right where we left off. Not sure when I saw her last, but am certain I would never ever have thought that that time would have been my last. Thursday happened while I was out of town for work. I was in New York City and saw a musical on Broadway and a concert at Carnegie Hall yesterday. I shared with Danny that I was doing so and he responded: “Ruthanne would be happy that you were celebrating music.” I hate that I am so far away, but it helps to know it would make her happy and that I am celebrating something. Returning home will not feel the same. For many, our lives will never ever be the same.